We spend one-third of the day sitting in a chair, so choose a healthy and comfortable chair is particularly important. We continue to improve and innovate, only for your comfortable and healthy life. ✔ 360 degrees free rotation, Free height adjuster, you can freely swing back and forth to meet various comfort needs. ✔ Ergonomic design. Backrest and cushion fit perfectly with the human body, comfortable, safe and effectively relieve fatigue. ✔ Back line design, wraparound enjoyment, perfect fit the body back and relieve pressure on the spine. ✔ Large armrest with massage pattern design. ✔ Super breathable mesh cloth with strong shaping, anti-tear, anti-dirty. ✔ Flexible elastic fabric, Integrated 30-density rebound sponge. 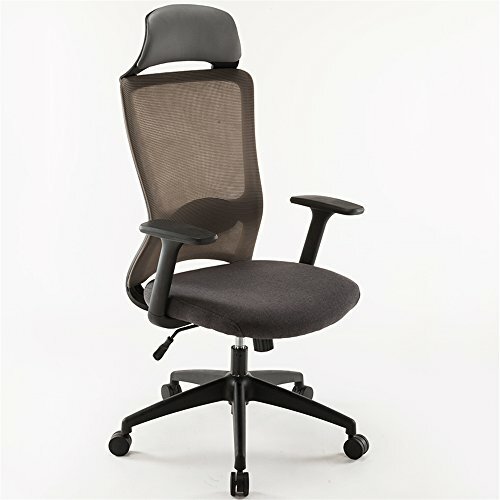 【Ergonomic Design】: This chair according to ergonomic design. Backrest and cushion fit perfectly with the human body, comfortable, safe and effectively relieve fatigue. Back line design, wraparound enjoyment, perfect fit the body back and relieve pressure on the spine. Head flexible design, strong support to the head, soft and comfortable. 【High Quality Material】: Super breathable mesh cloth with strong shaping, anti-tear, anti-dirty, skin friendly and comfortable, breathable for all seasons. Using heavy-duty metal materials, Pneumatic bar with international SGC certification & 300 lbs load-bearing steel pipe with BIFMA certification, VERY safe and reliable. 【Fully functional】: 2 in 1 Functional Lever - pull out the lever that's used to ajust the chair height and also you can use it back tilt adjustment. 360 degrees free rotation, Free height adjuster, you can freely swing back and forth to meet various comfort needs. 【Applicable to Multiple Scenes】: Modern simple fashion, elegant and decent appearance provide comfortable working environment. Smooth lines ergonomic design, enjoy relaxing at work. 【Friendly Customer Service and Warranty Guarantee】: The item comes in one carton and simple assembly is required. If there is a problem when delivery, please feel free to contact us at any time. Free replacement or money back guarantee for any quality problem within 30 days.